Hero of the French Resistance, diplomat, and two-time recipient of the Prix Goncourt under two different pen names, Gary (1914-1980; The Life Before Us, 1975, etc.) examines the fates of young love, naiveté, and idealism in his final novel, set in France during World War II and being published in English for the first time. Ludo Fleury, an orphan raised in Normandy by his eccentric kite-building uncle Ambrose, suffers like the rest of his family from "an excess of memory." As a boy he falls desperately in love with a Polish nobleman's daughter, the beautiful and spirited Lila de Bronicki. Ludo visits the Bronicki estate in Poland ("a country accustomed to being reborn from its own ashes"), discusses politics with Lila’s brother, and competes with her German cousin Hans and a musical prodigy named Bruno for her affection. But war is looming, and the lives of all five become inexorably entangled in it. 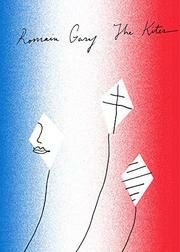 Gary, a Lithuanian Jew whose real name was Roman Kacew and whose life story reads more like fiction, writes with knowledge and empathy about occupied France and the struggle of ordinary people to resist. " 'Sensible' men...printed and distributed papers in which they spoke of 'immortality,' a word they employed frequently, despite the fact that they were always the first to die." The Fleurys' neighbor, a famous chef accused of collaborating, insists that just by setting foot in his restaurant, "any German with a shred of sense...can see he's dealing with supremacy, with historical invincibility." Ludo sustains himself with detailed memories of his time with Lila, though a fellow Resistance fighter warns him that when he sees her again she will have changed: "Even ideas stop resembling themselves when they're embodied." Gary's nuanced story avoids easy dichotomies. Ludo can't shake the idea that "the Nazis were human. And what was human about them was their inhumanity." Finding a dying German soldier, he thinks at first he recognizes the man, then realizes "what was familiar to me was the expression of suffering...German or French, in those moments, it's interchangeable." A rich and layered love story that begins in innocence and moves through hardship toward a broad humanity.